Are Other Rich Snippets Overriding the ‘Mobile-friendly’ Tag? So… what’s going on here? 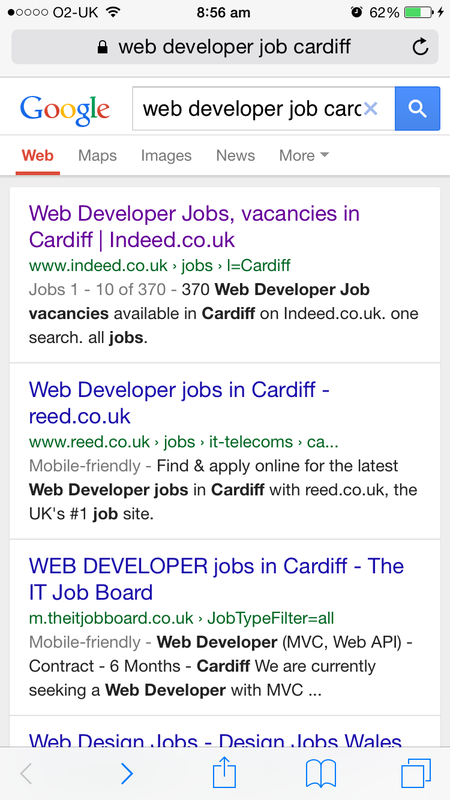 Notice how the label next to Indeed.co.uk’s result shows ‘Jobs 1 – 10 of 370’ instead? I have a feeling that this rich snippet is overriding the ‘Mobile-friendly’ tag for this result – i.e. that Google is choosing to show the former instead of the latter (even though both are true)… which isn’t good for Indeed.co.uk (more on that below). I thought that maybe this was a one-off error, so I found another result with the same issue. For the same keyword, the 6th result (on both mobile and desktop) is this page of Jobsite’s website. 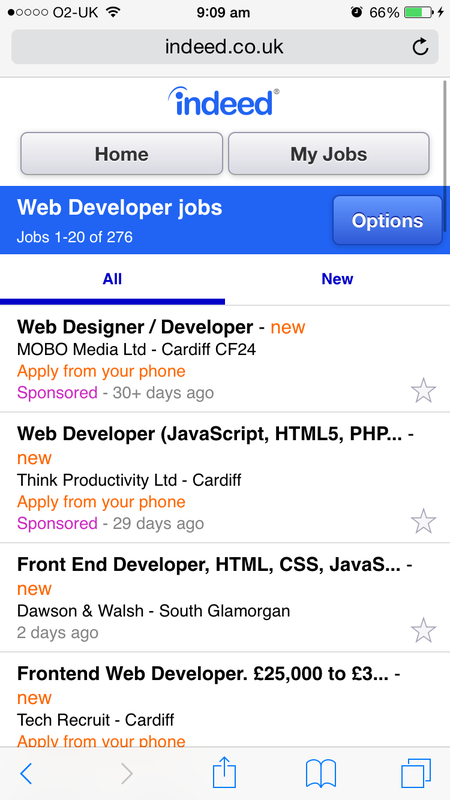 Again, similar to Indeed.co.uk, instead of ‘Mobile-friendly’, Google’s opting to show ‘Jobs 1 – 25 of 118’ instead. This is probably an automated design consideration on Google’s part. 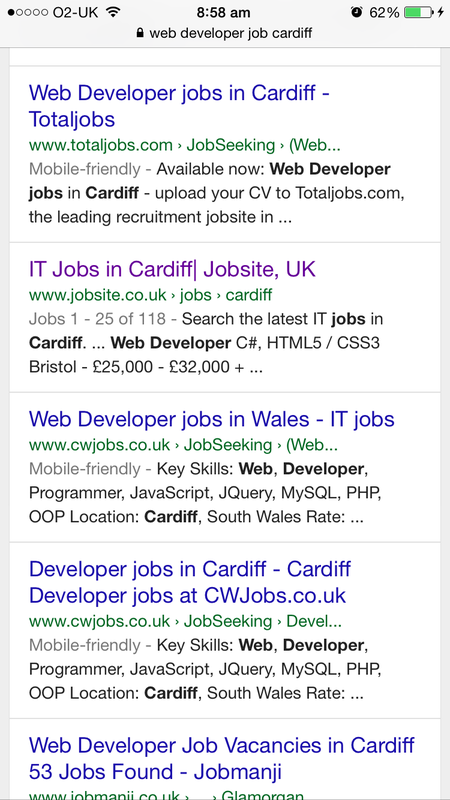 Showing both ‘Mobile-friendly’ and ‘Jobs 1 – x of y’ for both results would probably make each of the results look a little ridiculous, so it’s opting to choose the latter over the former. While it doesn’t seem to be affecting their rankings in mobile because Google does still consider them mobile-friendly (as mentioned above, they rank as strongly on mobile devices as they do on desktop), the problem here is that as searchers become more attuned to the recent changes and decide to show preference by clicking/tapping on results labelled ‘Mobile-friendly’ compared to those that are not, Indeed.co.uk and Jobsite could see less of a click-through rate from searches from mobile devices even though they are mobile-friendly. What’s worse is that the ‘Jobs 1 – x of y’ label doesn’t look like it’s been implemented purposefully (e.g. via Schema.org or something similar), so it doesn’t look like there’s an easy workaround for the two sites to get Google showing preferences to the ‘Mobile-friendly’ tag instead. The results for Indeed.co.uk and for Jobsite for their respective pages in the Google Developer Testing Tool (used to test and check rich snippet implementation) do not show that these have been implemented in this way from what I can see. I did wonder if it might’ve been due to pagination implementation instead (i.e. 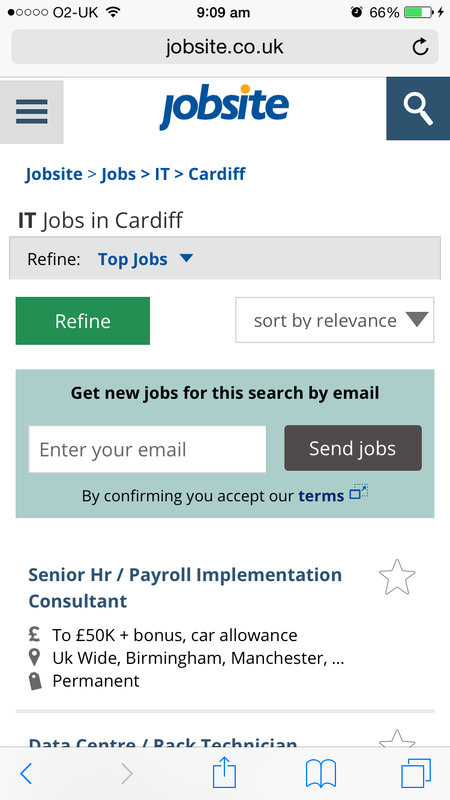 rel="next" & rel="prev"), but Indeed.co.uk isn’t using it and Jobsite actually looks like they might’ve implemented it incorrectly. So it looks as though Google’s simply noticing the count on each of the pages and adding the rich snippet itself based on that. With this in mind, the only solution that I can think of for either site is to remove those counts, which could negatively affect each site’s UX. But after all, they shouldn’t have to make changes to their websites worsening the UX in order to get Google to show something else instead – surely that’s against what Google wants websites to do? If I’m missing something (I could very well be!) or if you’ve noticed something similar with the same rich snippets or even other rich snippets then please drop a comment below or tweet me with info. Next Article: MOM is 2! It’s perceived as a display bug of some sorts that they’ll be looking at to see if it needs to change. 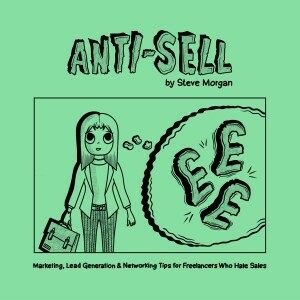 She and I discussed whether the lack of mobile-friendly tag would affect click through rate, and whether the over ride of mf tag was the best user experience. Thanks for the comment, Grant. Glad to see someone else confirming this and that high-ups in Google are already aware of it as well. 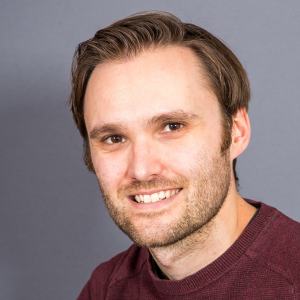 It has to affect CTR – if not now then in the future when more and more searchers realise that they don’t want to click on sites without the label. So I hope that Google seriously consider making sure that the label takes precendence over other forms of rich snippets. No, wasn’t public, we’ve been on the same panel at some SMX conferences and happened to both be speaking at SES Miami. This was something my team were concerned about so I brought it up with MO afterwards, sent some examples, and confirmed with her that this was a known issue. I think it’s a stretch to say they’re encouraging.. this was for one specific issue that I highlighted for one specific site, where I was concerned with the possible / feasible / potential impact of the mobile-friendly tag being usurped. *And* they were still looking into the snippet behavior 3+ weeks before the launch to consider potentials internally. So “actually encouraging people”, no. Having a friendly discussion, exploring ‘what if’ scenarios between professional peers thinking through a likely issue. Sure. Would want to ruin my friendship with MO by misquoting her, would I? That’s fair enough, Grant – I appreciate that. Ok, so perhaps using the word “encouraging” on my part was a step too far, especially as the original wording was “it might be worth…” and not “you absolutely, definitely should…”. But from what you’ve said, if others are in a similar situation to you then they could (perhaps not should, but could) consider taking on-board MO’s feedback for their own purposes as well, assuming that they’re also affected by this issue. But you’re right to say that MO’s feedback was directed to you and your situation.